A deal removing the risk of disruption to flights when Britain leaves the European Union must be hammered out within weeks or bookings will begin to suffer, the head of the International Air Transport Association (IATA) warned. While tickets for the period immediately after Brexit on March 29—which coincides with the start of the airline industry’s summer season—have been available for months, the main sales rush should be just beginning, Alexandre de Juniac, IATA’s chief executive officer, said in an interview Tuesday. “The massive sell out is now, six months in advance," De Juniac said at Bloomberg’s European headquarters in London. “Everybody thinks there’ll be a solution and so they’re not deterred from buying a ticket. But the closer we get to April, the more uncertain things are and the bigger the impact will be." IATA said last year that airlines faced an effective October deadline for concrete measures guaranteeing the continuation of services beyond Brexit. 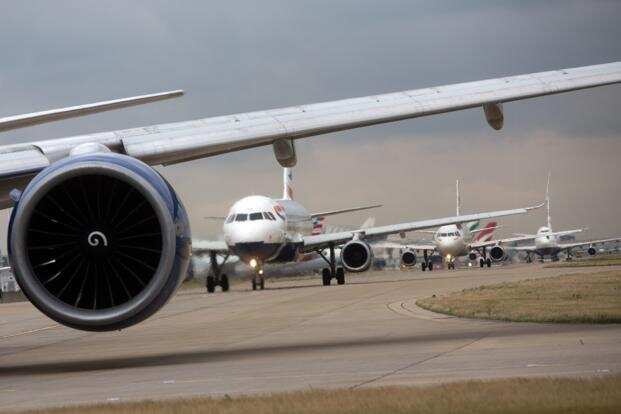 Instead, Britain on Monday published aviation guidelines for a no-deal split that highlighted the risk of disruption to flights from a possible EU refusal to extend both traffic rights and technical approvals of aircraft and parts. IATA, which represents about 290 airlines accounting for more than 80% of global traffic, will publicly make its concerns more explicit if nothing is forthcoming soon, De Juniac told Bloomberg. The notion that the issue of grounded flights could be addressed in the final hours approaching the Brexit deadline is nonsensical, he added. “It is crazy," the former Air France-KLM Group chief said. “To think that you could negotiate such technical matters in the last hours on as sensitive a subject as aviation, with the safety issues. It’s totally unprofessional, risky and disrespectful to the passengers who will have bought a ticket." Half of Britons meanwhile reckon flight delays and cancellations are likely to occur in the aftermath of a no-deal Brexit, with 53% believing that travel between the UK and EU will become more difficult, according to the results of a poll of 3,000 people by KPMG, released Tuesday. De Juniac said a trade war between the US and China hasn’t yet had an impact on airlines, since President Donald Trump’s tariffs have been confined largely to goods that aren’t generally transported by plane, such as steel, aluminum and car parts. The rising oil price has had a more negative effect, especially where it has coincided with a weakening of the local currency, as in India, Turkey and Persian Gulf states, the IATA chief said. At the same time, traffic was generally buoyant in the northern summer, with occupancy levels high, especially in Europe and the US, so IATA isn’t currently considering a cut to its guidance for industry wide net income of $33.8 billion this year. The estimate was reduced from $38.4 billion in June as earlier fuel-price rises and labour costs began to eat into earnings.